It's Secret Recipe Club time again! This month I was assigned Shockingly Delicious written by Dorothy. I was so excited when I saw that I was assigned Dorothy's blog. I have been following her blog for a few months now and had already bookmarked a couple of recipes to try! But I still spent time to go through all her recipes and found some I will definitely be making in the future like this chili and her Chicken Teriyaki Meatballs. I also have my eye on Dorothy's Green Tomato Chutney as our garden is overflowing with green tomatoes. But in the end I chose Cookies and Cream Rice Krispies Treats to make for today's reveal. My main reason was that Hasan's favorite cookies are Oreos and he also loves Rice Krispies Treats so it was a perfect combination. I had Hasan help me make these one day after school and of course Bilal came running to help too. I had them pour in the Rice Krispies and Oreo chunks while I mixed it. Since I was making something that Hasan would love I had to picture them in Mighty Machines. Anyone that knows Hasan knows he's crazy about Mighty Machines. The boys loved them! We served them to guests as well and they were also crazy about them! I made some changes to the recipe. I used Marshmallow Fluff instead of marshmallows. The Halal marshmallows make very tough Rice Kripsies Treats. When using Marshmallow Fluff you need to reduce the amount of Rice Krispies. I also reduced the amount of Oreo Cookies and white chocolate to adjust the sweetness to our taste. Thank you Dorothy for a great recipe! Grease a 9x13 baking dish and set aside. I lined my non stick cake pan with foil and then sprayed with some oil. In a large pot on medium-low heat, melt butter. We want to brown the butter. First it will melt, next foam. The butter will become a clear golden and then brown. Stir frequently and keep a close eye on it so it doesn't burn. Reduce heat to low and add the marshmallow fluff. Mix well. Next remove from heat and add the rice krispies and coarsely chopped Oreos one cup at a time. Transfer to the prepared baking pan and spread. Press down with a spatula. Melt the white chocolate and spread on top. Sprinkle the Oreo "dust" on top. Press lightly. Allow to cool for 5 minutes. Then put in the fridge for 20-30 minutes. This will make it easier to cut. oh they look so yummy! Just just love the way you "plated" them, so cute! I am a huge fan of Oreos. What a fun, new way to use them. I can tell I would adore a bite of these. Oh yummy! I love how I could easily make these gluten free! Does using marshmallow fluff work better than using actual marshmallows? Your picture is super happy! I find marshmallow fluff difficult to get out of the jar...it's very sticky. You can hop over to Dorothy's blog to see the original recipe where she uses store bought marshmallows. With fluff you need to reduce the amount of rice krispies. I used it b/c it is gelatin-free. I would never have thought to add oreo to rice krispies! 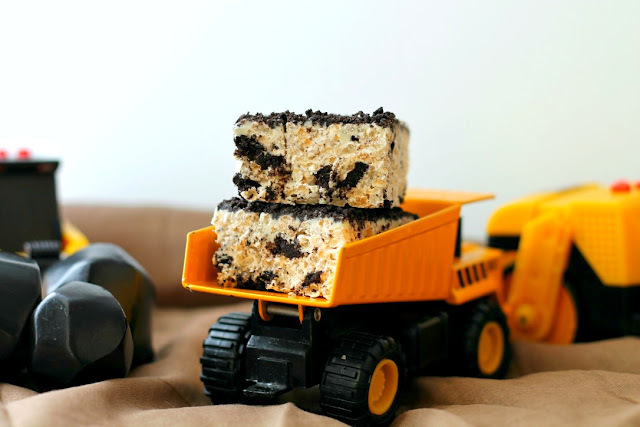 I am so raiding my kids' rice krispies to make these! So fun that you let your kids help out and I love the presentation in the truck! Anything with oreo and fluff is a must have treat in this house:-) Great SRC post!!! What a fun treat for the boys - cute putting them in the little truck! These sound wonderful + I love that they're gelatin-free, as i try to use gelatin only if i absolutely need it. YUM! These look delicious, Oreos are always a hit around here too! And I love that adorable picture! How cute! Oh and they look delicious!! Thanks for doing such a great job from my blog this month. Perfect choice for a recipe to make. We all love these RKT! Happy to "meet" you through SRC! Thank you for linking up to Tasty Thursday and happy (super late) reveal day! wow these look amazing!! Right up my alley :) I had Dorothy's blog for a previous reveal - loved it!! oh wow. never considered making rice krispie treats with fluff before. very cool!